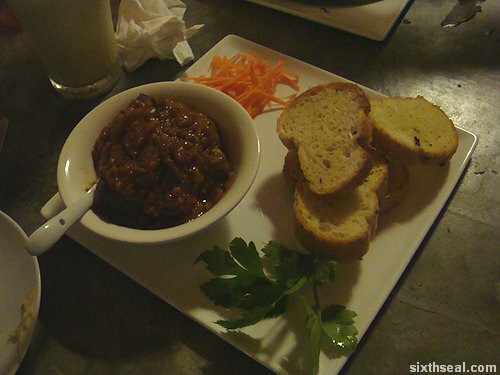 Payung Cafe is a new eating establishment nestled in a quiet corner of town. It’s only open for dinner so not a lot of people are aware of the existence of this place yet. Payung translates to “umbrella” in the our fine national language. 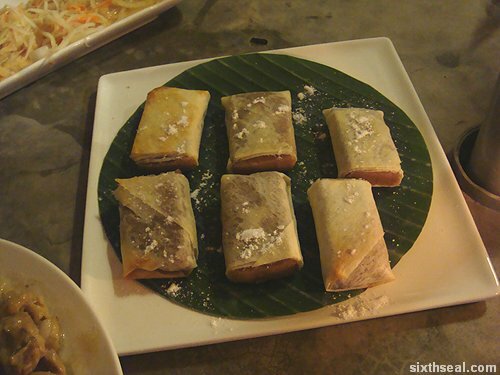 Payung Cafe is meant as a secluded al fresco dining establishment that allows you to BYO wine. It has a nice, quiet ambiance that is well suited to conversation. The owner of Payung Cafe is also the resident chef. 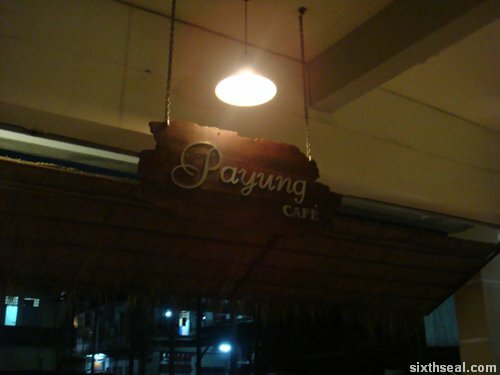 The concept of Payung Cafe is to serve fusion food incorporating elements of the ASEAN countries. 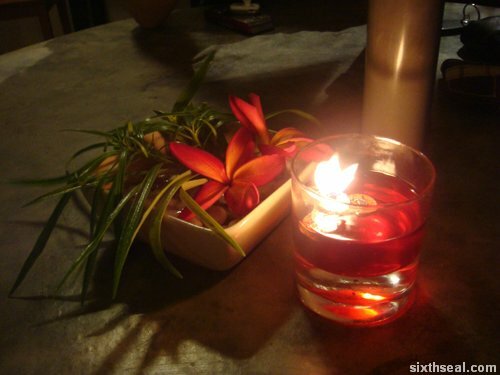 The seating arrangements are comfortable, with freshly cut orchids garnishing the tables. It’s nice touches like this that gives out good vibes to the customers. 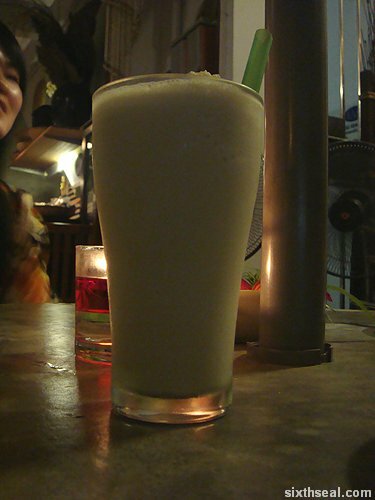 The special of the day was the Green Tea Shake (RM 5) which most of us opted for. It’s made from freshly brewed green tea, not the stuff in cans. It tasted great, the milk doesn’t overpower the green tea and less milk is a Good Thing (TM) nowadays since I seem to have become lactose intolerant ever since I was admitted into ICU for overdosing and got renal and liver failure. Strange eh? 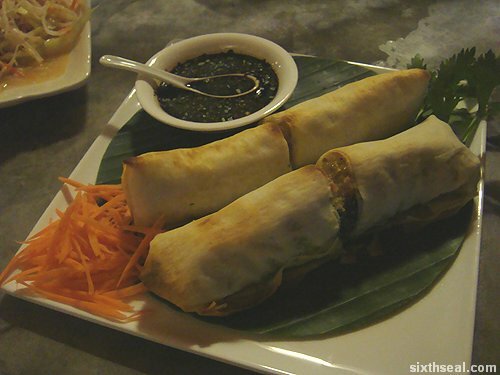 Spring Rolls (RM 6) is the Vietnamese influenced starter and it tasted pretty authentic. I know coz I did a tour of duty back in ‘Nam during the 60’s. Me love you long time! 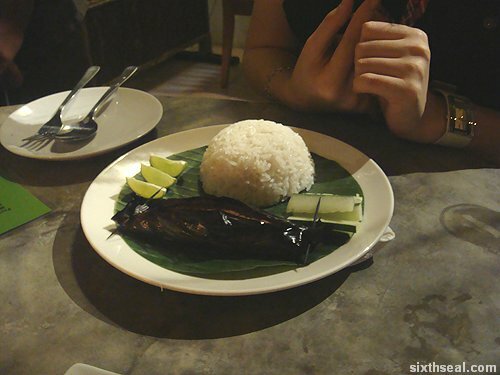 This is the Otak Rice (RM 8) that Joyce ordered. She missed the otak otak from her days in JB and have been craving for it since. It was so good that she ordered another four (4) otak otak (RM 32) for us to try. 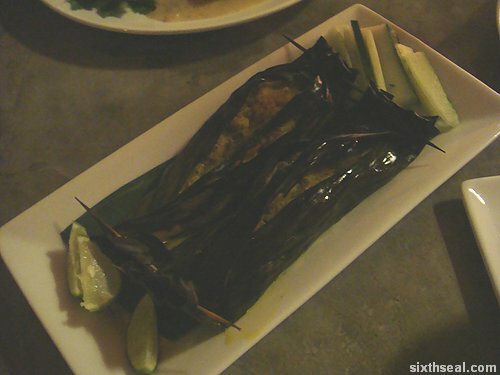 Payung Cafe’s implementation of the otak otak contains a secret killer breed of chillies that makes it so spicy even the hardened ones amongst us (me and Kath) were tearing up due to the sheer Spice Factor and the others won’t even touch it. Heh! I went for the Beef Ball with bread (RM 15). The presentation for this carnivore staple is great, with mint leaves garnishing the dish. 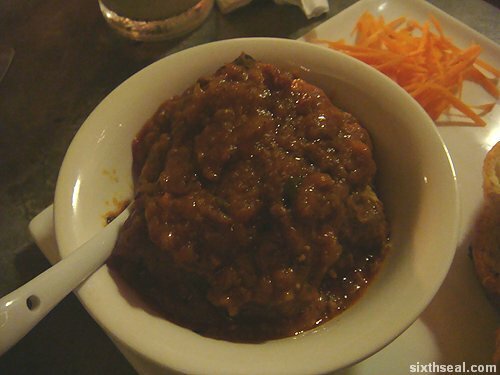 However, it should be noted that the portions at Payung Cafe tends to be on the small side. It’s a little bit too small for a main dish. 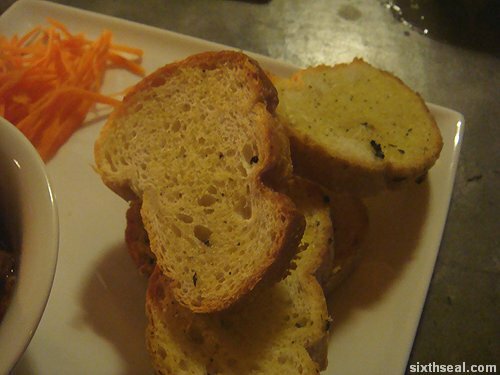 …and three (3) minuscule slices of garlic bread accompanying it. I wouldn’t even go so far as to call it bread, it’s more like crumpets. 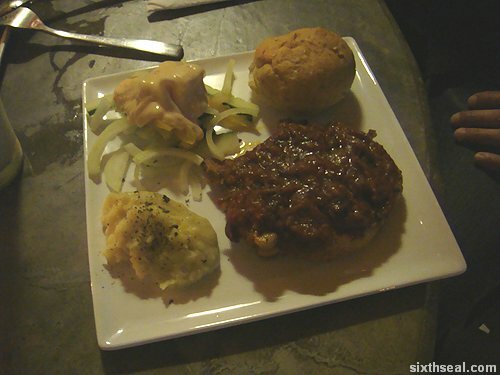 Colin had the Pork Chop (RM 18) which was also rather conservative in size. Size does matter, okay. It tastes good though, I had a small bite (which took up about 1/4 of the pork chop). The proprietor was kind enough to serve us complimentary desserts though. He also handed me a pen and paper and asked me for my dubious guidance in naming the dishes. The first one was a baked banana pie sprinkled with powdered sugar. I wrote down Tropical Paradise, Bonkers for Bananas, and Banana Pockets. 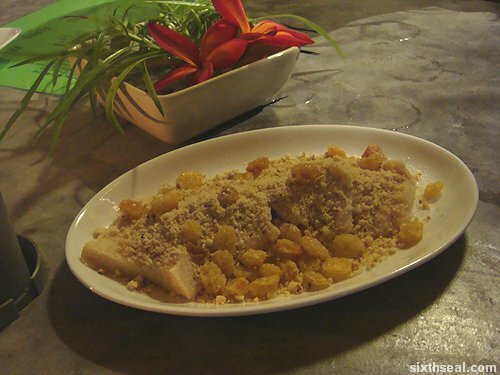 The second dessert is a soft custard topped (heaped, more like) by ground peanuts, sultanas and raisins. I could only think of Nuts about Raisins and Tropical Shower. I don’t know if he’s going to end up using my suggestions but it was a fun exercise nevertheless. 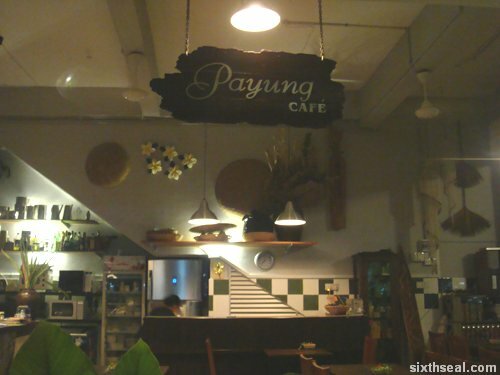 Payung Cafe is a quiet alcove nested in a town that has excellent service and great food. The ambiance is soothing as well. 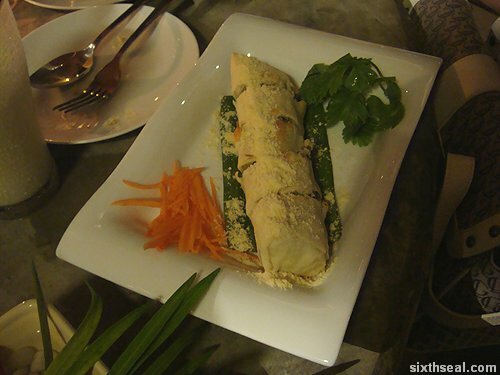 They could do with larger portions for the mains but overall, we enjoyed the experience. Cheers! Where is that? How come u went never invited me leh> Sulk! Sulk!…LOL!!! Aiyour! Open umbrella inside the house, old Chinese people say sial like dat!!! 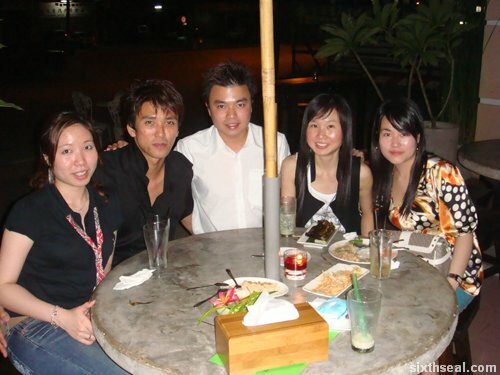 Hey.. who’s da guy beside u hb, i use to know him. forgot his name.. wonder if he still playing bball. Dude, hiding in the paragraphs the line “I know coz I did a tour of duty back in ‘Nam during the 60’s.” cracks me up…reminds of a few tobacco spitting old timers who come to our facility. Leaving On a Jet Plane….. YAY! I leave tonight and am dreading the journey, but look what I have to look forward to when I get home? FOOD! If u have time,please go to try a small ‘sui jiao'(water dumpling) shop at Mitsu Shabu2 road there. Its a corner shop and very small. The water dumpling there really delicious. Try to introduce that shop at your blog. 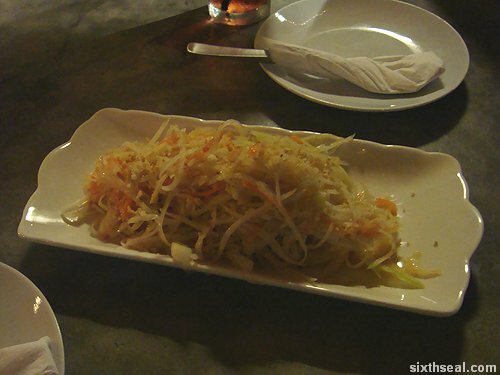 kongkay: It’s at Lanang Road, near Kingwood Hotel. Drive to the city from Lanang and you’ll see it. clementwpy: Really? OMG, I’m so outdated, I only knew about it recently. It’s near the KASI surveyors office. 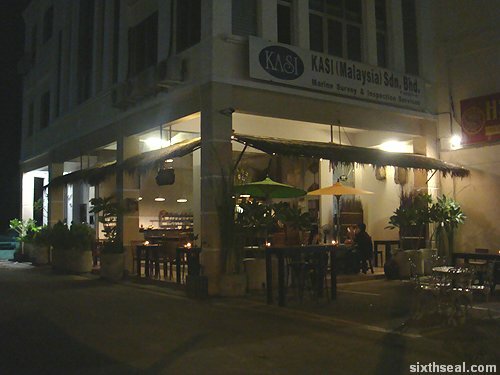 Opposite Daiti Trading, drive down to the city from Lanang and it’s near Fat Mum and Kingwood Hotel. It’s not open in the morning so that’s why it’s not very noticeable. There’s also no outside signage. Yeah, it’s already available in Malaysia. Er…mine was from Jusco too. Haha! FeiJi: His name is Colin. Engaged to Joyce. Yeah, he still plays basketball. e: Heh! I’ve never been to Vietnam so I can’t vouch for the authenticity but I’ve been to Vietnamese restaurants in Melbourne that the Vietnamese say are authentic. Closest thing, I guess. Yeah, I just drank some milk just now too. Too hungry after the swim. No problem, and thanks for reading. Ya, that Payung word also means umbrella in Tagalog and Kapampangan…here is video of pop star Rihanna’s “Umbrella” song in Kapampangan…. Peace and I’ll write soon, will be going to Europe. Bill: Interesting! The same word is used in Indonesia too. Probably coz we’re all so close together. Have a safe trip and hear from you soon. Cheers!